Organization has never been so easy and colorful! 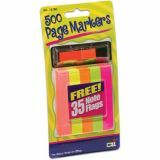 These bright markers and flags stick on any page easily and peel off just as smoothly. 30 each of 5 colors plus 30 Free Arrow Flags! Organization has never been so easy and colorful! These bright markers and flags stick on any page easily and peel off just as smoothly. 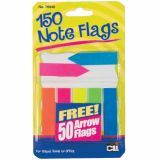 100 each of 5 neon colors plus 35 Free Note Flags! Post-it® Super Sticky Notes have 2X the sticking power so your message can stay front and center. In a fun cube format featuring 400 sheets, you can always have a note close by for quick memos and reminders. 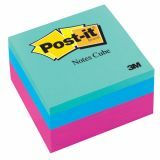 Bright blue, pink and green colors ensure your note stands out. Unique adhesive technology allows you to stick and restick so reminders can go with you. Great for vertical surfaces like walls, doors and more. 1 Cube/Pack. 3 in. x 3 in. Cube, Bright colors. 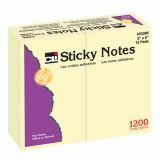 Post-it® Super Sticky Notes have 2X the sticking power. Leave a cube on your desk so you always have a note close by. Great for reminders and short notes. Post-it® Super Sticky Notes are recyclable. 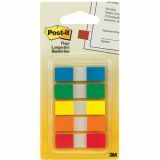 Post-it® Flags in Assorted Primary Colors and .47 inch wide size are a tool that makes it simple to mark, flag or highlight important information. They are safe to use on almost all documents. The low profile dispenser makes it convenient to keep them in your purse or briefcase so flags are always close. Contains 100/on-the-go dispenser and 1 dispenser/pack. Adhesive-backed sheets stick and re-stick to most wall surfaces, unlike flip chart paper. The paper resists marker bleed through so you can capture input by writing directly on the sheet. 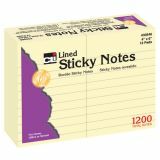 Use with Post-it® Super Sticky Notes to organize ideas. Whenever you want to brainstorm, present, or track projects, they're ready to help you succeed. 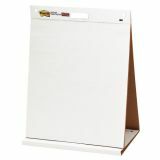 Portable white premium self-stick flip chart paper with built-in easel stand. 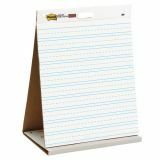 Portable white primary ruled premium self-stick flip chart paper with built-in easel stand. Use the easel pad with Post-it® Super Sticky Notes to make learning fun with colors and interaction. Post-it® Super Sticky Easel Pads are also available in larger standard sizes with Grid Lines, Lines, Bright Yellow, White and White Recycled Paper. Self stick, removable and repositionable adhesive note pads. 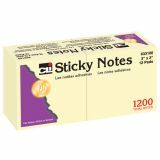 Advanced adhesive ensures that notes stick securely and lay flat. Yellow 12-Packs 1-1⁄2" x 2"
Self stick, removable and repositionable adhesive note pads. 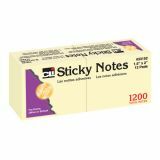 Advanced adhesive ensures that notes stick securely and lay flat. Yellow 12-Packs 3" x 3" Plain. Self stick, removable and repositionable adhesive note pads. Advanced adhesive ensures that notes stick securely and lay flat. Yellow 12-Packs 3" x 5"
Self stick, removable and repositionable adhesive note pads. Advanced adhesive ensures that notes stick securely and lay flat. Yellow 12-Packs 4" x 6"